Week 2 Results for the Lafarge Grand Prix now available. Please see the Grand Prix results here. 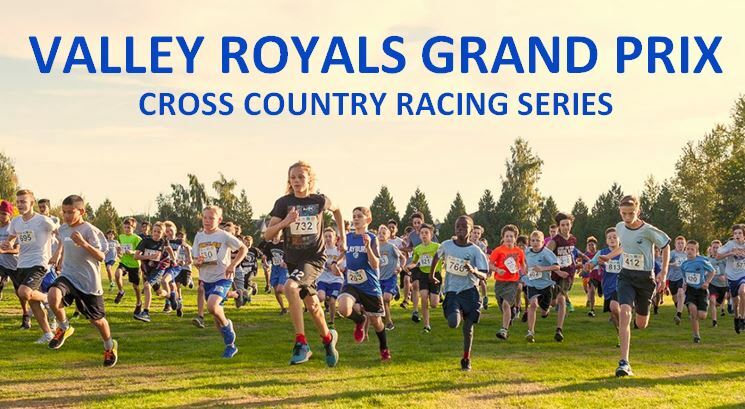 On a day that finally looked like Cross Country Season had arrived, a pair of Rookie Royals acquitted themselves well on the course at Bear Creek Park. Amy Brandt, and Katia Heppell both made their Royal debuts, and performed wonderfully well against the tougher competition of a B.C. Athletics meet. Amy secured a Bronze medal in her 1000m race, while Katia placed fifth in her 3000m race. Amy ran all alone in her round, and was a bit surprised by the pace of the more experienced racers, while Katia benefited in her outing from some wisdom and advice from the more seasoned Gabe MacGregor who also ran the same contest. Illness kept Gabe from her best outcome, but she still ran as strong as circumstances would allow. All in all, it was a good showing for the first event of our Cross Country endeavors. team finish in the Varsity Division. Former Valley Royal athlete and now club director Jeremiah Johnston will be wed to Mariah Guppey on the May holiday weekend of 2013. It’s wise that Jeremiah and Mariah have planned the celebration well in advance as the groom’s occupation as a shoe representative for a major firm means that he is on the road for many days of the year. But we are pleased and happy for both Mariah and Jeremiah and wish them the very best with the wedding plans and their life together thereafter. Valley Royal past president Mike Inman is recovering nicely at his Abbotsford home after undergoing triple bypass surgery a month ago. Wife Charlotte, a former Valley Royal board member herself, reports that she knows that Mike is recovering because he is once again occasionally cranky. And what’s the hardest thing for Mike to endure during his recovery period? : having to sit in the backseat when out for a drive. “Yes,” stated Charlotte, “there is nothing like having a real back seat driver boss me around.” We are pleased you are recovering Mike and it won’t be long before you are once again able to take the driver’s seat. Under the direction of club director Cindy Miller and summer student employee Aisha Klippenstein, a new web site has been designed for the Valley Royals. It’s a very attractive site we hope it will be easier to find information on. Although this is the first release made directly to the new web page, we hope to have a lot more updates in the future. We are very pleased to report that long time Valley Royal President and current club director Mike Inman is making a successful recovery from triple bypass surgery Tuesday at the Royal Columbian Hospital in New Westminster. When Mike grumbles you know things are improving. It’s good that he was not able to view the Canada vs. USA soccer match (all three of his daughters, including past University of Washington 1500-meter All-American, were soccer players in their youth). As an aside, Charlotte completed her nursing training at the Royal Columbian Hospital. Mike and Charlotte met on the 2S ward at RCH and although it is now completely refurbished, that is the same unit that Mike is now a patient. Will look forward to having you up and about in a few weeks Mike. London, England—August 7, 2012: Michael Mason placed eighth in the final of the Olympic Games high jump competition but cleared the same height as three other jumpers that tied for the bronze medal. Mason cleared 2.29 meters in a competition won in the rain by Russia’s Ivan Ukhov who with 2.38m. Second place went to Erik Kynard with 2.33 meters. Following were six other jumpers, including Mason, all of whom cleared 2.29 meters. But the tie breaking rule that states the number of misses at the last height attempted followed by the total number of misses in the competition, decides the order of finish for any runner-up position. Unfortunately, Mason had two misses at 2.29 meters while the other competitors who cleared the same height did it with just one or two attempts at that height. Canada’s Derek Drouin took 3rd place along with two others with fewer misses than the remaining 3 jumpers. But it was a great competitive effort by Mason who has truly established himself as one of the world’s elite high jumpers. Mason will now remain in Europe and take part in the Diamond League series of meets that include the Samsung Invitational scheduled for Lausanne, Switzerland on August 23. Mike Mason and fellow Canadian Derek Drouin both were successful in today’s Olympic Games qualifying round of the high jump in London. England and have advanced along with 12 others for the final that takes place Tuesday morning at 11:00 a.m. Pacific Daylight saving time. Mason cleared 2.26 meters in Group B while Drouin cleared 2.29 meters in Group A. On advancing to the final Mason had the following to say…”It was a bit of a tough day technically. It took me a while to get going and find my mark. Getting my third attempt at 2.26m secured my spot in the final. I’m relieved and looking forward to it.”. Drouin had the following to say about his qualifying performance, “It was stressful, I’m not one to have a lot of misses like that. I usually like to clear on my first attempt. I wasn’t that nervous coming in here, I’m not sure what was going on. I’m relieved to get through and excited for the final.”.